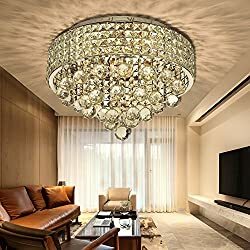 A1A9 Modern Luxury Rain Drop Rectangle Clear K9 Crystal Chandelier Ceiling Lights with 5 Lights for Living Room Bedroom or Study Room L31.5" X W10" X H8.8"
168975 products found in Crystal Chandelier. 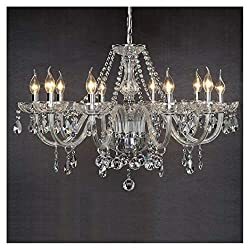 Your request for Crystal Chandelier revealed a total of 6168975 results. Product Features:  Detail Size: Diameter 80cm Height 60cm Chain 60cm. The Chain could be moved. Suggested room fit:Complex building, villa, living room, bedroom, dining,room, Foyer,Hallway, Office, meeting room, waiting room, coffee shop,library, study room, corridor, stairs, etc...,  Bulb Type:E14 X 10, Max 60Watts (Bulbs not included). Voltage:220V~240V. Compatible with many kind bulbs: Dimmable Blubs, Energy saving bulbs, Led Buldb,Halogen Bulbs etc.,  Material:Glass & Crystal. Absolutely glass crystal made. Exquisite shining crystal droplets and dishes. Will be sparkling in your room.The really item will not let you dispoint. The really one is more nice than pics.,  High-quality Luxurious Beautiful rainfall design, sparkles from every angle, Gorgeous chandelier!!! This is a good value for money and made my living room luxury. 100% worth the price and good quality.,  Requires self-assembly. Easy to install. 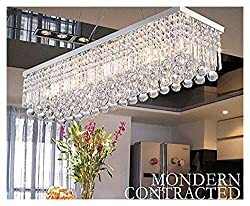 Instruction is included.,  Fashion Rain Drop Design----This Crystal Chandelier is absolutely FABULOUS! It will well worth the time and effort.